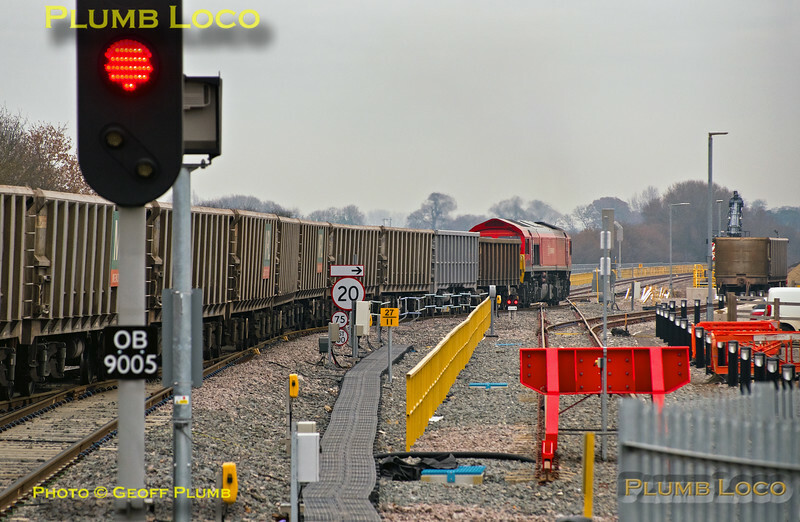 DB Cargo 59202 has run round its train in the terminal sidings at Oxford Banbury Road aggregates depot and is now propelling the empty wagons out of the terminal and across the crossovers into Oxford Parkway station, Platform 2. This was 6V01, the 11:04 from Banbury Road to Acton Yard, a working which frequently runs early at this point - as soon as the train had crossed over and the route reset, it was given a green signal and departed at 10:58, twenty minutes early. It then has to sit in the Bicester Village area while 1Y32, the 11:13 from Oxford Parkway overtakes it. 10:56¼, Friday 2nd December 2016. Digital Image No. IGMP22056.